A mobile-friendly site: table stakes for the m-commerce game A mobile-friendly site can help a business connect with customers and increase sales, but a bad mobile experience can drive customers to the competition. With this in mind, FragranceNet.com got to work. The new, mobile-optimized site design features fewer graphics, larger font sizes, as well as bigger product images and buttons. FragranceNet.com also has improved the mobile site experience by reducing the number of steps required during the checkout process to decrease cart abandonment. Nadboy says a major goal was to do less merchandising on the mobile site, and get shoppers through the checkout funnel as quickly as possible. Before the mobile-optimized site was launched, traffic from mobile devices was 9.6%. After launching the mobile site, this increased to 13%, a 35% increase. FragranceNet.com is constantly updating the mobile site to improve mobile user experience, including tailoring the mobile experience for each user depending on if they are a new or returning customer. 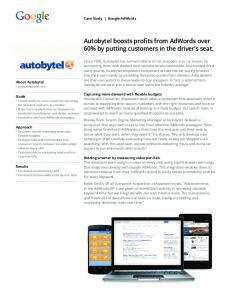 The company is further boosting traffic and sales on the mobile site through the use of Google Mobile Ads. The campaigns apply the same keywords used in desktop-targeted Google AdWords campaigns, but different copy, ad SiteLinks for discount coupons, and recommendations for “best seller” products that are targeted toward mobile users and smaller screen sizes. “The performance of our mobile site has been in line with our current expectations, but we’re also well equipped for the very near future when the use of mobile devices to access the web is on track to eclipse the use of desktop computers.” —Michael Nadboy, vice president of online marketing and strategic development, FragranceNet.com The company initially saw a dip in average order values (AOVs), but only because the merchandise available on mobile was more limited. After offering coupons and free shipping for orders over $70, AOVs are on the rise, and for FragranceNet.com, it’s just the beginning of their m-commerce efforts. The new optimized website features fewer graphics, larger font sizes, as well as bigger product images and buttons. for FragranceNet.com, and the company's marketing team sought to remedy ... the use of Google Mobile Ads. The campaigns apply the same keywords used in. while their conversion rates improved by 17% across mobile and desktop com- pared to ... goals, marketing objectives, creative assets and user data to give the. looked like.â â Wendy Yuan, marketing manager, US-Mattress. 'Extremely simple' transition. The shift to Shopping campaigns was âextremely simple,â Yuan adds. âThe setup made it easy to transition and categorize all of our products. ... www.